I saw Noah over the weekend. Stop reading now, if you don’t want spoilers. Seriously. Right now. As a preacher –and somebody who’s heard endless blogviating (blogging + bloviating) on this movie for the past week– I thought, why not? Jump in with your own views. 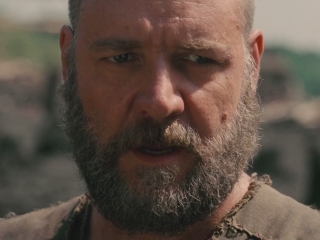 The primary point of the blog is that the Darren Aronofsky’s Noah is pretty clearly Jewish Noah, not a Christian one. The moment I read that one thought it made the entire movie make more sense. So, I commend the blog to you. It gives Chattaway’s thoughts on Noah, but also some fine quotes from many other Jewish bloggers, professional and non-professional theologians. Many of the writers offer up the idea that Noah is a modern Midrash. Yes, it’s using the Biblical text as its base. But it’s also attempting to use story and metaphor for make broader points. As such, then, it’s not unfaithful to some fundamentalist, or even progressive, Christian version of the Bible, because the filmmakers were not approaching it from that perspective at all. Like I said, reading this one point, was an “Aha!” moment for me, concerning the film. 3) The actual Noah story itself. My favorite analysis might be the quotes from Rabbi Marc Gellman, who seemed to have some of the same theological problems with the film that I did. Namely, that “The Creator” in this movie is deeply eager to kill all humanity, but then disappears from the story all-together. I mean, I don’t mind Noah being a Modern Midrash. But there’s a pretty huge and gaping hole in the story’s arc near the end, when Noah decides to spare his grandchildren, and the family decides to try again to repopulate the earth. The gaping hole is that there’s no mention of God’s new covenant with human beings; arguably the primary point of the entire story. In the movie, it’s Noah who decides to spare his family, not God. In the movie, it’s Noah and his family, who just decide to “start again and be good human beings” this time. Did the filmmakers just forget about this? In other words: in the film, God is all destroyer, despite the fact that God’s called “The Creator” throughout. The good news of a new covenant, the good news that God promises never again to destroy human beings, all of that gets lost at the end of Noah. We’re left with humans who are left to their own devices. YES! Bingo! Exactly my point too. “Finally, Aronofsky’s modern midrash is in thrall to a very unbiblical, but sadly contemporary ideology: Nature is good and people are bad. If you’re an antelope, try telling that to the lion chasing you. Nature is “red in tooth and claw.” Nature is utterly amoral. The strong pray on the weak. By idealizing nature and demonizing human beings, “Noah” totally inverts what the Bible teaches, and what we ought to believe because it’s true. People today can be evil, but we can also repent and improve. Lions still chase antelope and they can’t see rainbows and covenants. I mean, that fight scene? Straight from the Lord of the Rings movies, it seems to me. Which brings up one final point. Imagine if the Peter Jackson had been as unfaithful to the “Lord of Rings” books as this movie is to the plotline of Genesis? There’d be total and utter chaos among fans. I’m not a literalist. I’m not defending their views, really. But I would ask all my fellow non-literalists (and even atheists friends) to have a little sympathy for the religious folks who have a problem with the film. If Jackson’s movies took the liberties that this movie does with the “original story” you’d be hearing the same hue and cry from Tolkien-literalists. Anyway, it’s a fascinating blog, and fascinating movie. Check it out.